We just happened upon a great article on Boston.com about Valencian paella, which could serve as an excellent introduction to anyone curious about the dish. To the surprise of most visitors, classic paella Valenciana is nothing like the ubiquitous plates of orange rice festooned with shrimp and mussels. Valencianos call that dish “arroces con mariscos,’’ which translates as rice with shellfish. The authentic local paella comes from the garden, not the sea, even though this is a seaport city. Filled with fava beans, green beans, land snails, and pieces of chicken and rabbit, this paella is cooked in a shallow pan over a hot fire. 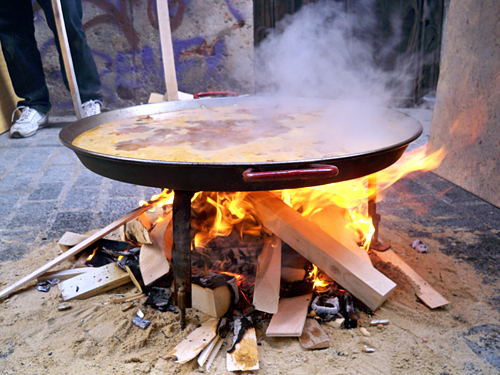 We’d also add that paella is considered to originate from Valencia, and is a mark of pride for Valencians. So, the seafood paella is actually a variant on the (superior, in our opinion) original paella Valenciana. Naturally, the article highlights Valencia’s most famous paella restaurant, la Pepica (patronized by Ernest Hemingway). We’ve not had the opportunity to go there — does it really deserve the hoopla? In our experience, there’s not much difference between the quality of paella at a fancy or a budget restaurant because the dish is difficult to screw up. Juergen and I have a special place in our hearts for Boston — we lived in Cambridge’s Central Square for a couple years, and is where we first met. It’s a wonderful city. Pepica is good but maybe a bit too pricey… On of my favorite for ‘arroceria’ is Yuso in the old town. Continue the nice blog, it’s great! Nice blog post. We enjoyed paella every day while in Valencia and never got tired of it.